This week at ABC and 123 the Summer Picnic talk is about crafts. You would think this would be easy for me--is anything ever easy? I was trying to think...my favorite craft? I can tell you my least favorite--did you see my last post:)? My favorite though, there are so many to choose from. I was trying to look at it from the children's point of view. What crafts have I done with them that they just love? This probably could turn into quite a long post, so I'm just going to pick a few. 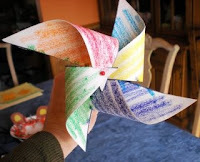 The first craft that popped into my head was the pinwheel I make with the children in March. They just love making a craft that is functional. I think they love watching it spin too. 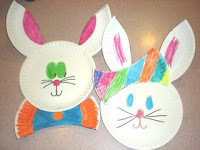 The paper plate bunnies I make with the children at Easter has always been a favorite. I think they like how they can make it a boy or a girl. I also have always enjoyed this craft. I have been doing it with all my children since graduating from college. Peek-a-Boo Chick is a craft that always brings a big smile. They love opening that egg and seeing the little chick inside. Skeletons are fun for little guys--I don't know why, but they love skeletons. I have to admit, it could be smaller. Placing on all the styrofoam peanuts doesn't always hold everyone's attention. 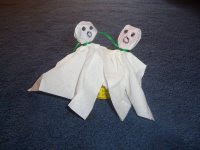 The lollipop ghosts are always popular--it's probably because they get to eat a lollipop, but they're still cute. I know these are just a few, but you don't want to be here all day do you? I'm so excited that you have a skeleton craft listed today!!! My son is so interested in the human body right now and skeletons. We have been reading books, watching videos, etc on the body. He will love that craft! Your pinwheel project literally blew me away. And I am also excited about skeletons, since my daughter is really fascinated with them. Thank you for sharing. Oooo fun ideas!! !Skeleton way cool! I mentioned your blog and linked on my awards post. I highlighted new blogs I have discovered and really liked. Those pinwheels are such a summer favorite aren't they? Your skeleton is a very fun idea. We'll have to give that one a try. They are fun...classics mixed with new stuff! Thanks for joining the picnic! I loved those paper plate bunnies. They seem yet yet still cute and fun. These are too cute!!! love the ideas! These are some great ideas to look out for and keep children busy. I found pinwheel very cute. You can even go for some innovative home based ideas like you can let child let play in bath and make iceberg for them, make paddling pools for them, make sand-pits... Children will love all these.